Build Your Online Brand With a Web 2.0 Plus Web Site. How well is your existing web site designed? Get your free web site evaluation and legal web strategy consultation. Is your web site good enough for a "connected generation"
DirectLaw’s online marketing solution offers a Web site optimized for search engine placement, complete with an integrated online legal services delivery system. We call our law firm web sites - Web 2.0 Plus Web Sites because they contain the interactive and collaborative features that a connected generation wants. 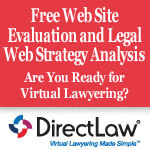 All of the web site that we develop are integrated with our DirectLaw Virtual Law Firm Platform. We don't do brochure web sites. (We think a simple, brochure web site, is a waste of money. It might have been good for your law firm in 2004, but not 2017). DirectLaw™ Complete is our best value. A free Web 2.0 Plus, web site included with a 12-month DirectLaw™ Complete subscription Plus Legal Content + Web-enabled document automation + libraries of automated legal forms + create your own forms + create your own legal services to sell online. Redesign an existing Web site to incorporate a virtual element and deliver online legal services. A robust Law Guide containing thousands of FAQ’s and legal content in all common areas of law; and much more. See below for more info on included features. This content is invaluable for search engine optimization. Built on the WordPress foundation, making it easy for you to edit on your own and to add your own content pages as your practice evolves. NOTE: Header graphics/banners are based on a library of premium templates that we have developed. If you want fully customized header graphics, an additional $300 customization fee is required. Other than custom content/messaging that a firm provides, the only customizable elements are the header graphics and the predominant colors/fonts used throughout the site. 12-month term required. $49/month Web site hosting, maintenance and support fee* is waived during initial 12 month term ($588 savings). A subscription applies to one (1) state jurisdiction. Contact us for multi-jurisdictional pricing. DirectLaw ClientSpace™ PayGo - $49/month (solo) + $50 per additional attorney/month*. $999.00 upfront Web site development fee. Includes Core Features PLUS our Web-Enabled Document Automation functionality, including access to libraries of automated documents (usage fees apply). 12-month term required. DirectLaw ClientSpace™ Complete - $199/month (solo) + $50 per additional attorney/month*. FREE Web site development; $0 development. Core Features PLUS our Web-Enabled Document Automation functionality, including access to libraries of automated documents. 12-month term required. *Custom pricing provided for firms in excess of four (4) attorneys. $49/month Web site hosting, maintenance and support fee in 2nd year and beyond. Your DirectLaw-provided site must be hosted on our servers. The platform cannot be used as a standalone solution. It must be integrated with an existing or new web site. A form to collect e-mail addresses for a newsletter, if you wish to create one to keep your clients informed of new developments in your practice area(s). A client contact and support form. Assistance in writing your Profile Page so that it is search engine optimized. Web statistics system and traffic reports. Basic Search Engine Optimization for your site. Optimization for a consumer direct response web site for selling "unbundled" legal services over the Internet. Custom domain and up to ten (10) e-mail boxes. Search engine and Directory Submission. Optional Extra: Google, Yahoo and Bing Keyword Ad Campaign Initial Setup. Ongoing campaign management offered as an additional service. All sites are built on the WordPress platform. Technical support questions answered or resolved within a 4 hour window during business days.